Pampering yourself is a great way to keep your life in balance, but a trip to the spa doesn't always fit into your schedule or budget. Why not enjoy the ultimate convenience of a relaxing spa right in your Springs luxury apartment home? Here are some of our favorite tips for transforming your bathroom into a spa without spending a lot of time or money. Spas have a clean, minimalist look that has no place for vivid colors or bold patterns. You can't go wrong with white, but gray, taupe and seafoam green are other soothing hues. Have you ever seen a spa where surfaces were cluttered up with extraneous toiletries, damp washcloths and crumpled tissues? It's hard to relax in a spot without any order. Store items in cabinets or pick up some elegant countertop organizers. One of the more pleasurable elements of the spa experience is wrapping yourself in thick, thirsty towels. Check out stores like Bed Bath & Beyond for high-quality towels that won't break the bank. Everything looks better in candlelight. Create an arrangement with staggered heights and different sizes that will improve the decor as well as the ambiance. Aromatherapy involves the use of specific scents to improve mental and physical well-being. If you want to go beyond candles and essential oils, try layering your favorite aromas with bath oils, lotions and other skin care products. In addition to purifying the air, live plants bring a natural touch that's automatically calming. If you have pets, be sure to choose plants that are non-toxic to animals. Wall art isn't just for living rooms and bedrooms. Add personality and visual interest with charming bathroom-themed pictures or compelling graphic prints. Want to read, write in your journal or just sip a glass of wine as you soak in some bubbles? Bathtub caddies come in a wide range of styles to hold whatever you want nearby. They can also serve as storage when the tub isn't in use. Washcloths are fine for your face, but the rest of your body deserves more. Loofahs, poufs and pumice stones remove dry skin and stimulate blood flow for a rejuvenating feel. Traditional bath mats are soft, but they can quickly end up looking sloppy. Wooden bath mats are modern, architectural and tidy, and they're also much easier to keep clean. 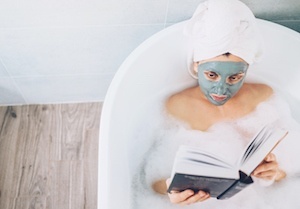 What's your favorite way to unwind after a long day? Tell us about it in the comments!